Custom Joy-Con shells are all the rage at the moment, with fans creating their own unique looks for the Switch's diminutive controllers. We've seen some impressive pieces of craftsmanship over the past few months but this latest project will certainly strike a chord with veteran gamers who fondly recall the original Game Boy. 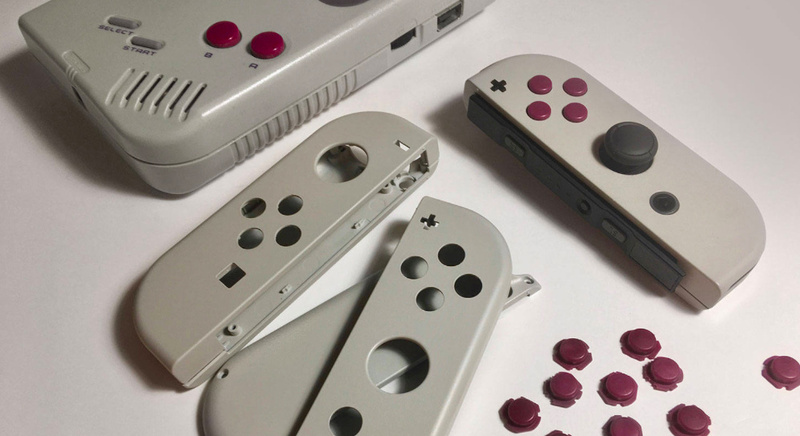 Colour-matched with the 1989 classic, these shells mix custom-cast buttons with housings that have been painted the same colour as the monochrome handheld. A protective coat is applied over the top of the paint. According to the manufacturer, these are being produced in limited quantities so be sure to get in fast. I watched an IGN video before of changing the Joy-Con's casing and it's too much hassle. These do look nice but you risk damaging them and you absolutely void your warranty. Nintendo's financial results came out a few hours ago. That is much more interesting to talk about. I'm happy with my red and blue Joy cons. I actually like the vivid neon colors that mine is, straight out of the factory. I've never seen colors like that on any Nintendo hardware so this is a refreshing change. Why would anyone want to replace that with a drab gray color? I’m thinking about changing my regular grey JoyCon to atomic purple. They look cool, plus the standard grey gets greasy around the ABXY and directional buttons. No matter how much I clean them, I just can’t get rid of it. I even wash my hands before playing. Anyone else have this issue? It’s driving me up the wall. Also, are there any particular Nintendo OEM JoyCon colours that are impervious to this issue? Or at least better than the grey. @Mooj738 Thought that was a possibility. For such a great system, it looks awful. I wouldn't recommend changing the joy-con shells. I bought some crystal clear shells for mine which looked amazing but the plastic was very slippy compared to the original shells, also the R button was very very sticky and did not feel right at all so I put the originals back on. Nintendo is missing out on the market by not releasing more Joy-Con variety. But I love my Mario Red Joycons I got this past Saturday. Got the Splatoon ones, the neons and the basic grey too. Do I need them, no. But darn it, if I am gonna work full time I am gonna treat myself! I think they're doing pretty good when it comes to variety. I just want to see some Limited addition joycon for certain games, like Zelda Joycon that are green and gold, stuff like that. And a left joy con with a D pad, although I'm not sure if I would ever use it. I really really want White color for Switch. White all, the body tablet & Joy cons. I’m looking forward to the day that Nintendo has enough Switch stock that they will churn out more of their own variants. However they are focused on just keeping the system demand manageable. Anybody ready for the Gameboy Classic/Mini?